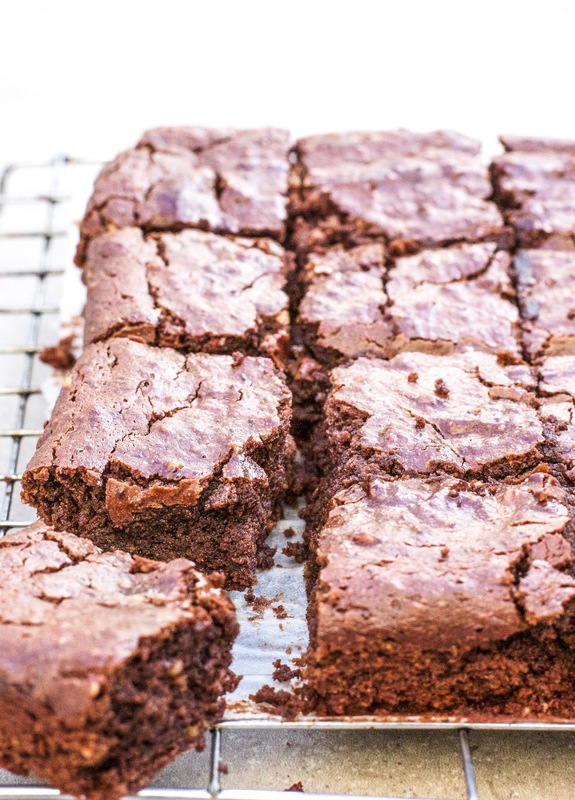 These are everything you could ever want in a brownie- fudgey rich and totally irresistible. Add 175ml of chickpea water (keep the chickpeas for something else), the vanilla, coconut sugar and flaxseed to a small saucepan on medium heat. Whisk until the sugar is completely dissolved. Add the mixture to a large bowl with the nut butter and whisk until smooth using an electric mixer. Add in the cacao powder, baking powder and salt and mix thoroughly. It will be a thick mixture. Line a baking tin with parchment paper and pour in the mixture, spreading it around evenly. If it’s very sticky, use a damp spoon to smooth it out. Bake at 180’C for about 25 minutes- I like them fudgey. Leave them to cool for about half an hour before slicing. look delicious, I must try them. Hazelnut butter would be gorgeous! Just wondering if it’s possible to get the recipe in grams? I always use cups, which I really recommend as it’s much easier to visualize amounts and adjust thing if needed! Conversion is different for each ingredient but there are lots of sites online or theres a great app called Kitchen Pro (it doesn’t have all ingredients but you can select things with a similar texture!). Hope that helps! How big are the cups? 1 and haft cups seems like a lot of almont butter. .would prob have to buy few jars..just wanted to make sure I’m not have a blonde moment and you actually mean cups as in a tea cup! No not tea cups! Cups are an actual measurement, which I really recommend using as it’s much easier to visualize amounts and adjust things if needed! You can get cup measures in any kitchen shop, in tesco, tiger etc for really cheap! If you want to convert them into grams it’s different for each ingredient but there are lots of sites online that you can use or theres a great app called Kitchen Pro (it doesn’t have all ingredients but you can select things with a similar texture!). Hope that helps! Hi, don’t have almond butter….never heard of it actually. Could I use sunflower marg instead?? Or where could I get almond butter? Many thanks, love your site. Could you use Agave instead of maple syrup? Yep, you can use agave or honey instead! I really like the flavour maple syrup adds in this particular recipe but it’s up to you! Hi. What size tin did you use? Thanks. I use a 9 inch tin, hope you enjoy! Hi, love your recipes! Do you think peanut butter would work? Peanut butter should work great! I’m allergic to peanuts so I’ve never tried it but cashew butter works really well so I presume peanut butter would too! Hope it works out for you! can you make a printing button, would make my life so much easier. thanks! – love your recipes ! Can I ask about the oven temp you use? Is it 180 degrees in a normal oven or fan oven? These look amazing. I was wondering how do you store them, if they weren’t going to be eaten straight away? Hi Indy, just wondering if I could use cacao nibs instead of chocolate chips and if so what quantity would you recommend as they are a lot richer than dark chocolate? Can you add fruits like raspberries to this? I’m confused because almond butter and maple syrup are not considered ‘clean’ foods. Interesting….. I used organic peanut butter instead of almond butter and two vanilla pods instead of the extract. They are delicious. Thanks for the recipe!